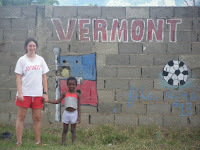 The University of Vermont (UVM) will lead three travel-study courses to the Dominican Republic to work with the communities of Batey Libertad and Saman during the 2008-09 academic year. These international service-learning courses have been run in partnership with these communities and local NGOs working in the DR since 2005. The first group of UVM students will be led by Drs. Pat and Jon Erickson during the Thanksgiving week. The focus will be community health, with projects including a Futbol para la Vida HIV/AIDS course at two local schools in Esperanza, a community health clinic, bed donations, and numerous projects involving upkeep and expansion of the services of the community center and clinic. Students are organizing a number of fundraisers in Burlington, Vermont, including a benefit dinner, candle and bake sale, a dribble-a-thon with UVM soccer teams, a run-a-thon with UVM running teams, and a 3rd annual Lose the Shoes soccer tournament. The class will also be supporting the annual Batey Libertad Coalition soccer tournament at Batey Libertad on Saturday, November 29th, and returning to Burlington, VT to host a World AIDS Day event on December 1st. Over the January winter break, John Hayden of UVM’s Plant and Soil Science Department and Seeds of Self Reliance will lead a class to continue the community gardening project with the Batey Libertad community. The class will also be helping to start a new community garden in Saman, a barrio of the city of Montellano in the province of Puerto Plata. More info. 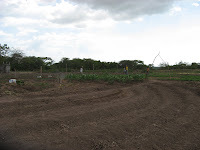 on last year’s class is available at: http://dominicancommunitygardens.org. To round out the academic year, McKew Devitt of UVM’s Romance Language Department will return for his 4th trip to Batey Libertad to continue work on language literacy and service-learning. The March ’08 class built a home for a family at Batey Libertad.